Nancy has been working, teaching and selling clay since 1974. She grew up in Northeastern PA., attended PSU for her Under-graduate degree. Apprenticed with a potter in the Allentown area in 1975-76. Participated in 2 Artist-in-Residence Programs (1977-78 and 1978-79) thru the PA. Arts Council. Participated in the Governor’s School for the Arts (a 6 week summer program). 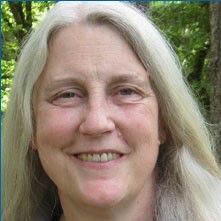 Nancy moved to Maryland in 1980 to attend graduate school. In 1983 she was hired by Montgomery County Schools to teach art. She has taught drawing and design, fundamental of art, photography, but mostly ceramics/sculpture until 2014. She has also continually taught at the Visual Art Center in Long Reach Village Center, Columbia, MD, & still does. During this time she continued to make and sell her own work via craft shows, craft shops and galleries. Nancy has been a part of The Clay Ground since its inception at the old location in Savage Mill and then on Main Street Ellicott City. Now here.